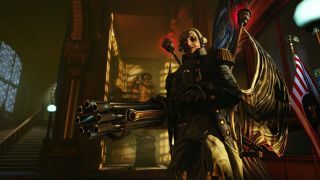 Irrational Games, the house that brought us BioShock Infinite, is shuttering its doors. Ken Levine, co-founder and creative director at the studio, wrote in a note that his passion "has turned to making a different kind of game than we've done before." To meet this new challenge, Levine is "winding down Irrational Games" as we know it, bringing a scant 15 employees over to a new venture that will focus on "making games for the core gaming audience." The new venture will stay within publisher Take-Two's walls. Levine noted that in time "we will announce a new endeavor with a new goal: To make narrative-driven games for the core gamer that are highly replayable." "To foster the most direct relationship with our fans possible, we will focus exclusively on content delivered digitally," he revealed. 2K, a subsidiary of Take-Two, will takeover BioShock. From the sounds of it, the BioShock franchise will continue on even after the last Infinite DLC is released. We chatted with Ken Levine in 2013 - read the full interview here!